After having been around the so-called bush, otherwise known as the system of favoritism and corruption in Massachusetts, many times over, I should not be surprised that it engulfs the most feeble and vulnerable. But I was, nevertheless, shocked that there is neither mercy nor justice even for small animals in Massachusetts. 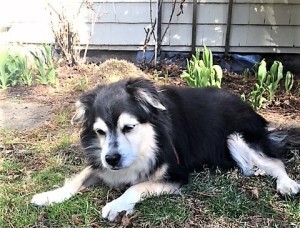 Last April Morty, a sweet Miniature Husky, was admitted to the emergency department at Massachusetts Veterinary Hospital with fluid in his chest and diagnosed with Stage IVb Lymphoma: the result of deliberate misdiagnosis and mistreatment at Natick Animal Clinic on a scope bordering on, if not actually epitomizing, ruthless abuse. As far back as 2015 Morty had serious symptoms that his owners as laymen pointed out to the vets at Natick Animal Clinic, all of which were later highlighted in a public circulation by PETCO as signaling “Cancer in Dogs” during their Cancer Awareness Month in 2017. All the therein named symptoms signaling cancer were treated at Natick Animal Clinic with every conceivable expensive in-house drug or procedure but the required referral to an Oncologist: the foul smell from his mouth, despite their recommended removal of a substantial amount of his teeth under the pretext of “infected gums,” the frequent throwing up, diagnosed by this Clinic as “acidic stomach” to be treated with antacids, the increased lack of mobility in his hind legs diagnosed here as “arthritis” and treated with Rymadil, Tramadol and Dasuquin purchased at this Clinic. Cancerous lumps, including swollen lymph nodes, were ignored as stemming from being a “lumpy dog” with “nothing to be concerned about” heavy panting and coughing, ignored as “theatrics,” diarrhea, treated with an expensive “special diet” from this Clinic. The scope of apparent negligence, eventually recognized as outright abuse, given Morty’s visits with numerous vets at Natick Animal Clinic since 2010, not only caused this little dog incredible suffering and prolonged pain. It also traumatized his owners for having unwittingly contributed to his suffering by having failed to provide him with the proper care and medication, or at least offer him greater comfort. All due to Natick Animal Clinic’s misinformation by its vets. Particularly distressing, since Cancer in dogs proved to be known as treatable in the early stages, and because Morty could have enjoyed a longer life free of the incredible pain he suffered at the hands of those entrusted with his care. In fact, how well he would have responded to proper therapy became apparent when Morty was briefly treated at the Massachusetts Veterinary Referral Hospital, where even his “chronic condition of being a teary eyed dog” – per Natick Animal Clinic- instantly cleared up with proper treatment. Sadly, his Cancer had already metastasized to numerous organs so that the brief remission barely lasted a week before his final decline set in and caused his death Mother’s Day morning 2017. It was obvious that the scope of Morty’s abuse at Natick Animal Clinic had been so extreme and persistent that it could hardly have been attributed to negligence alone. The systematic misdiagnosis of literally all symptoms associated with lymphoma in dogs over at least two years indicated willful neglect for the obvious purpose of holding on to a patient to maximize the income to the Clinic with expensive “Office Visits,” ongoing alleged “Senior Wellness Programs,” ineffective “treatments” and routine medicines instead of an appropriate and timely referral to an oncologist. The case was brought before the Small Claims Court Dedham for a refund of Morty’s inappropriate treatment charges for the two years preceding the fatal diagnosis of Stage IVb Lymphoma to honor this brave little dog’s fight against Cancer and to send a message to Natick Animal Clinic and all other Veterinarians like them, who abuse their helpless patients as cash cows to extort monies from their trusting owners. Unfortunately, the Small Claims Court’s Magistrate Beth Cook issued a judgment in favor of the corporate defendants, Natick Animal Clinic, slyly omitting to find fault as would be required upon review of the indisputable documentation of deliberate abuse, provided by Morty’s owners. Instead her “Judgment in Favor of the Defendants” sidelines the facts and simply states: “… the defendant(s) does not have to pay the plaintiff(s) any part of the claim costs.” What a victory for Natick Animal Clinic, animal abusers and extortionists everywhere. The Massachusetts legal system once again prevailed in protecting the well-connected guilty with a strong message of encouragement for them to proceed with their crimes.